No Questions Asked is a classic film noir from 1951 directed by Harold F. Kress. Kress never really made it as a director, but went on to edit some classic Hollywood films. This has a story from Berne Giler and a screenplay from Sidney Sheldon, both had long careers as writers in Hollywood. Our story starts out with Barry Sullivan playing Steve Keiver, an insurance investigator. He is in love with Ellen, played by Arlene Dahl. Ellen is a bit of a gold digger and wants to marry somebody with money. She soon disappears to go marry a rich man with no warning to our hero. Keiver buries himself in his work and becomes very successful. He works connections in the underworld to recover stolen property for his company. He soon finds the eye of Joan, played by Jean Hagen. She is madly in love with Keiver, but Keiver still has feelings for his old flame Ellen. When Keiver and Joan are at a fancy party it is robbed. This part is pretty interesting as the theft was performed by men in drag. They fool all of those they rob by gun point, and puts the police on the trail of “two attractive females,” instead of two males. This brings in Police Inspector Matt Duggan, played by George Murphy and Detective Walter O’Bannion played by Richard Anderson into the investigation. Our hero works both sides of the law to recover the million dollars worth of jewelry stolen at the party. Will he be able to work his usual magic to get the job done? Will he be double crossed or even framed? What girl will eventually win his heart? Who can he trust? This film noir is a bit of a hidden gem! It has a great plot with some good acting. I thought this was a sold film worth your time. 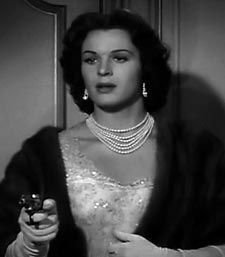 The gangsters are unique and the heist men who are cross dressers had to be a bit risqué for 1951. Especially since these cross dressers are not comic relief, but actually fool the characters in the film and I think they would have fooled most of the movie going public.